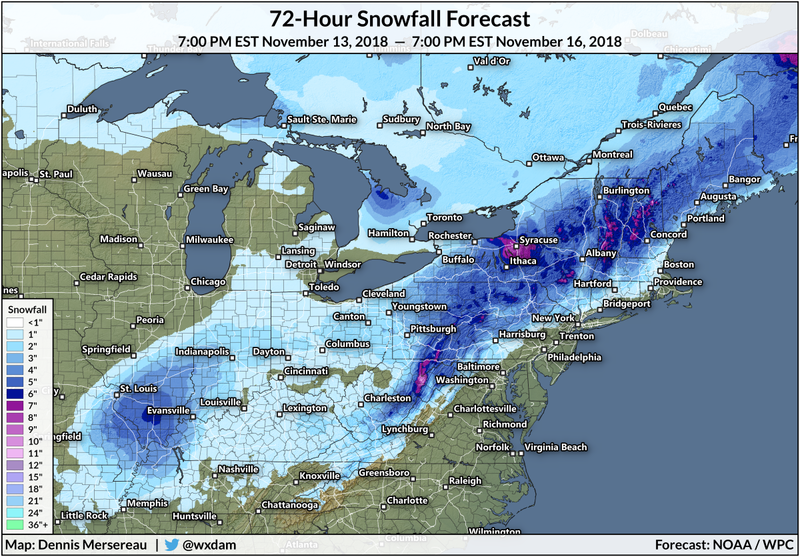 The raw chill that's settled over the eastern half of the United States over the past couple of weeks set the stage for winter weather to follow closely behind. There's a decent chance that many areas will see their first significant snow and ice storm between Wednesday and Friday, with the heaviest snow falling in the Midwest and Northeast, while freezing rain will coat much of the Appalachian Mountains in a crust of ice. Our storm developing tonight comes fresh on the heels of a storm that brought heavy snow to the southern Plains and heavy rain to just about everyone else east of the Mississippi River. More than half a foot of snow fell in parts of Texas and Oklahoma as the system met cold air locked firmly in place over the region. Farther to the south on the warm side of the system, persistent heavy rains and thunderstorms led to flooding and even a couple of reported tornadoes in North Carolina. That storm is out of here and the next one isn't far behind. An upper-level low will develop over the Mississippi River valley on Wednesday and slowly make its way east over the following two days. The system will bulk up in a hurry as it moves east, producing yet another prolonged round of heavy precipitation along its path. Cold air on the northern side of the system will allow precipitation to fall in the form of snow, sleet, and ice. The heavy snow will start falling in and around southern Illinois on Wednesday night and Thursday morning. Some areas could see more than half a foot of snow, though widespread shovelable totals will make it difficult to get around on Thursday. Snow will be more widespread across the Ohio Valley, Great Lakes, and Northeast on Thursday and Friday. Many areas west of I-95 are on track to see several inches of snow, with much higher totals in higher elevations and where lake effect snow enhances snowfall totals. It won't take much for the rain/snow/ice line to shift a dozen miles to the east or west, so if you live right on that line between nothing and something, it's wise to watch the forecasts and make sure you're ready with the ice scraper or snowbrush just in case. Temperatures hovering right around freezing with above-freezing temperatures above the surface will allow for freezing rain and sleet to fall in the Appalachians and parts of the Mid-Atlantic. 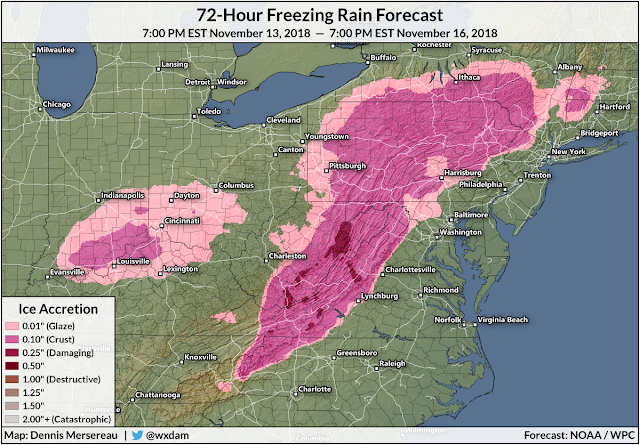 The most significant ice accretion will occur in the Appalachians, where one-quarter of an inch or more of ice is possible on exposed surfaces. 1/4" of ice doesn't seem like much, but that's a lot of weight on power lines and tree limbs, and it could lead to downed trees and power outages in some areas. The ice will also make travel difficult or impossible for a time on Thursday until temperatures climb back above freezing.